Too much clutter has all the negative effects in a home that you don’t want, to avoid it, you need to do proper house clearance and that takes a whole lot of time and effort. 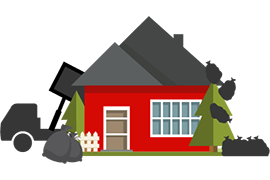 When you do not have time to take care of that, you need the help of companies like ours we are the best choice to make in Kentish Town and you can trust us to provide the best house clearance service, because perfection is our ultimate goal. Get in touch with our 24/7 customer service and you will get a rundown of all our services, pick one, then tell us exactly what you want gone from your home, share the amount of clutter we have to remove, and then tell us a time and date in which you want the service to be completed. Once we have all the necessary data, you will get a free price estimate so that you know exactly what you will be paying. After that the ball is in our court and we engage in doing the best rubbish removal service possible. Our collectors are the best in Kentish Town and in the NW5 area, because we train them to be the best, we have excellent workers who will do all they can to provide the best waste removal service they can. They are hard-working and punctual, they have the right attitude for the job and work in a friendly and conscious manner, they know what you need and they provide. Sensible prices for every service in the borough of Camden! Whatever work we have to do, whatever quality we provide, we always keep the prices according to your needs, we want our rubbish disposal services to be accessible by everybody in the NW5 area and we make it so by providing affordable waste collection services, you can hear them out at any time when you call our customer service. Never doubt the high quality of service we can provide, on top of it all, we also promise a green service, one that will help the environment as well the customers, when you use our house clearance company, you get everything you need – a great team to do a great waste disposal at excellent prices, what else is there to ask for? Call us today on +442037692921 and get the free price estimate to start the service.